The King's Return invited, &c.
Great Seal-Proceedings in King's Name. Great Seal, &c. of Ireland. Leave to attend the King. Although it can no way be doubted, but that his Majesty's Right and Title to his Crowns and Kingdoms, is and was every way completed, by the Death of his most Royal Father, of glorious Memory, without the Ceremony or Solemnity of a Proclamation; yet, since Proclamations in such Cases have been always used, to the end that all good Subjects might, upon this Occasion, testify their Duty and respect; and since the armed Violence, and other the Calamities, of many Years last past, have hitherto deprived us of any such Opportunity, wherein we might express our Loyalty and Allegiance to his Majesty: We, therefore, the Lords and Commons now assembled in Parliament, together with the Lord Mayor, Aldermen, and Commons of the City of London, and other Freemen of this Kingdom, now present, do, according to our Duty and Allegiance, heartily, joyfully, and unanimously acknowledge and proclaim; that, immediately upon the Decease of our late Sovereign Lord King Charles, the Imperial Crown of the Realm of England, and of all the Kingdoms, Dominions and Rights belonging to the same, did, by inherent Birthright, and lawful and undoubted Succession, descend and come to His Most Excellent Majesty Charles the Second, as being lineally, justly and lawfully next Heir of the Blood Royal of this Realm; and that, by the Goodness and Providence of Almighty God, he is, of England, Scotland, France, and Ireland, the most potent, mighty and undoubted King: And thereunto we do most humbly and faithfully submit, and oblige ourselves, our Heirs and Posterities for ever. Resolved, That these Words, viz. "God save the King," be inserted in the End of the Proclamation. Resolved, That the Lords Concurrence be desired herein; and that Mr. Turner go with it to the Lords. Mr. Turner further reports from the said Committee, the Ceremonies agreed upon, to be used in Proclaiming the King's Majesty. Resolved, That a Copy of this Proclamation, to be signed by the Speakers of both Houses, be forthwith sent to the Lord Mayor of the City of London. Resolved, &c. Nemine contradicente, That the King's Majesty be desired to make his speedy Return to his Parliament, and to the Exercise of his Kingly Office. 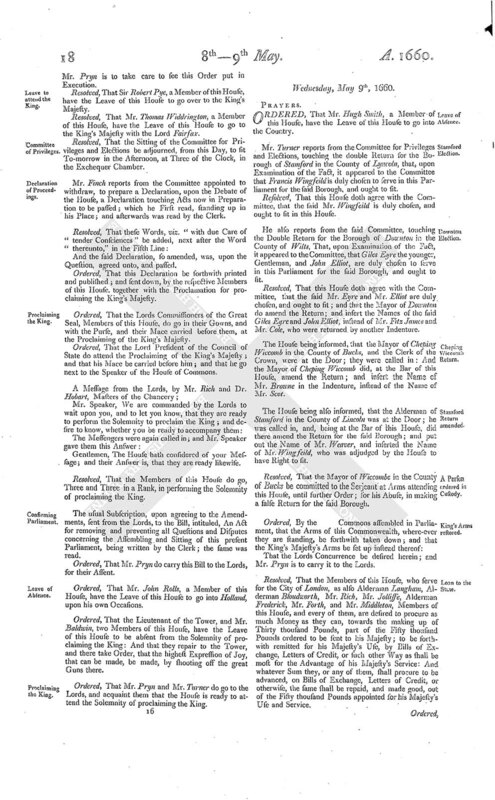 Ordered, That it be referred to a Committee, to consider of the Manner of the King's Majesty's Return and Reception; and of all Preparations requisite for those Ends; and of settling a Revenue for his Majesty; and of the Recovery of the Jewels and Goods belonging to his Majesty; with Power to send for Persons, Papers, and Witnesses. Resolved, That the Members of the Council of State, who are also Members of this House, be the Committee, to whom the Consideration of this Business shall be referred; and are to fit, in the Queen's Guard Chamber in Whitehall, To-morrow, at Two of the Clock in the Afternoon. Mr. Turner reports, that the Lords do concur with the Proclamation, as it was amended by this House; and that the Speaker of the Lords House hath signed it; and that the Lords have sent it to this House; and desire, that the Speaker of this House do also sign the same. Resolved, That this Proclamation be forthwith printed and published. Resolved, That the Members of this House, who serve for the several Counties, Cities, and Boroughs, do take care, forthwith, to send to the Sheriffs, Mayors, Bailiffs, and other Head Officers of the Counties, Cities, and Boroughs, of England and Wales, and the Town of Berwick upon Tweed, for which they serve, the Proclamation for proclaiming of the King's Majesty; to the Intent the same may be proclaimed in the respective Counties, Cities, and Boroughs; which the several Sheriffs, Mayors, Bailiffs, and other Head Officers, are required to do with Speed accordingly. Mr. Goodrick reports from the Committee, appointed to consider, from what time Proceedings shall pass under the Great Seal in the King's Majesty's Name, the Opinion of that Committee, that all Proceedings be in his Majesty's Name, from the Fifth of May, inclusive; being the Day of the Resolve of this House, "that in all Cases, where the Great Seal should be necessary to be used, all Proceedings should go in the King's Name." That, they knowing of no other Great Seal for the present, than That, which the House hath lately voted should remain in the Hands of the Earl of Manchester, and the Commissioners; it is humbly submitted to the House, by the Committee; Whether, for the carrying on, and present Expediting of the Justice of the Kingdom, the House shall think fit That Great Seal be made use of, until further Order:-And the Lords Concurrence to be desired. Resolved, That this House doth agree with the Committee, that all Proceedings be in the King's Majesty's Name, from the Fifth of May instant, inclusive; and that in all Cases, where the Great Seal shall be necessary to be used, all Proceedings do pass accordingly. Resolved, That this House doth agree with the Committee, that, for the carrying on and expediting the Justice of the Kingdom, the Great Seal remaining in the Hands of the Earl of Manchester, and the rest of the Commissioners for Custody of the Great Seal, be made use of until further Orders. Resolved, That use be made, in like manner, of all Seals belonging to any other Courts, till further Order; and that all Process and Proceedings in all other Courts be in the King's Majesty's Name. Resolved, That the Lords Concurrence be desired to these Votes; and that the Lord President of the Council of State do carry these Votes to the Lords. Resolved, That in all Cases, where the Great Seal of Ireland shall be necessary to be used, all Proceedings shall go in the King's Name, from the Fifth of May instant, inclusive; and that, for the carrying on and expediting the Justice of that Kingdom, the Great Seal of Ireland, remaining in the Hands of the present Commissioners for Custody of the Great Seal of Ireland, be made use of there, until further Order; and that Use be made, in like manner, of all Seals belonging to any other Courts in Ireland, till further Order; and that all Process and Proceedings, in all other Courts there, be in the King's Majesty's Name. Resolved, &c. That the Proclamation agreed on, for proclaiming of the King's Majesty, be sent to Ireland, to be there proclaimed: And the Commissioners, for managing the Affairs of Ireland, are required to cause the same to be proclaimed accordingly. That the Lords Concurrence be desired to these Votes; and that Mr. Annesley do carry them to the Lords. Ordered, That Serj. Browne, Mr. Perrepont, Serj. Hales, Ld. Commissioner Widdrington, Mr. Finch, Serj. Glyn, Mr. Pryn, Mr. Serj. Twisden, do forthwith withdraw, and prepare a Declaration, upon the Debate of the House. Resolved, That Mr. Scobell, Mr. St. Nicholas, and all others, who have in their Hands or Custody, any Records, Books, Papers, or Proceedings, belonging to the House, do forthwith deliver the same to Mr. Jessop the Clerk of this House; that they may be ready upon all Occasions for the Service of this House. 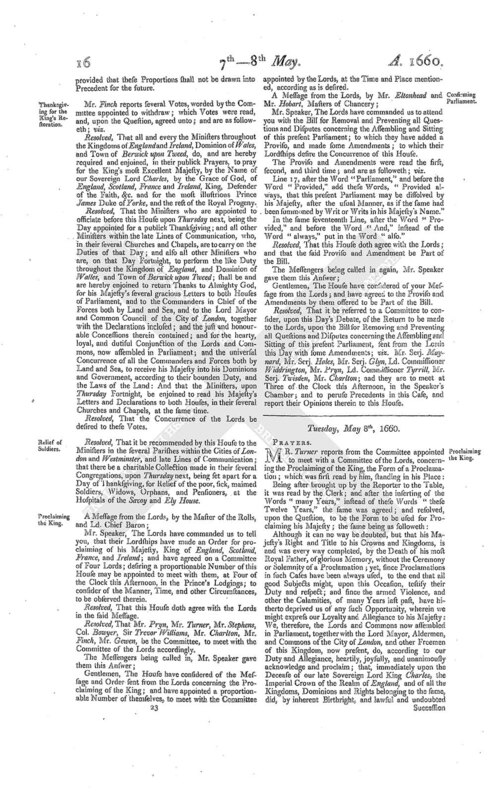 Mr. Speaker, We are commanded by the Lords, to deliver unto you this Message: The Lords have appointed a Committee of the Number of Eight Lords, to meet with a proportionable Number of this House, To-morrow in the Afternoon, at Three of the Clock, in the Prince's Chamber; to consider of the Manner of Reception of the King's Majesty, in the best Way that may be for his Honour; and to hasten his coming. Resolved, That this House will send Answer to the Lords Message, by Messengers of their own. The House have considered of the Message you brought from the Lords; and they will return Answer by Messengers of their own. Ordered, That Mr. Henry Cromwell, a Member of this House, have the Leave of this House to go into the Country for Seven Days. Resolved, That the Arms of the Commonwealth, which are now placed over the Speaker's Chair, be forthwith taken down; and that the King's Majesty's Arms be set up there, instead thereof; and where-ever the Arms of the Commonwealth are set up, that they be taken down, and the King's Majesty's Arms set up instead thereof: And Mr. Pryn is to take care to see this Order put in Execution. Resolved, That Sir Robert Pye, a Member of this House, have the Leave of this House to go over to the King's Majesty. Resolved, That Mr. Thomas Widdrington, a Member of this House, have the Leave of this House to go to the King's Majesty with the Lord Fairfax. Resolved, That the Sitting of the Committee for Privileges and Elections be adjourned, from this Day, to sit To-morrow in the Afternoon, at Three of the Clock, in the Exchequer Chamber. Mr. Finch reports from the Committee appointed to withdraw, to prepare a Declaration, upon the Debate of the House, a Declaration touching Acts now in Preparation to be passed; which he First read, standing up in his Place; and afterwards was read by the Clerk. And the said Declaration, so amended, was, upon the Question, agreed unto, and passed. Ordered, That this Declaration be forthwith printed and published; and sent down, by the respective Members of this House, together with the Proclamation for proclaiming the King's Majesty. Ordered, That the Lords Commissioners of the Great Seal, Members of this House, do go in their Gowns, and with the Purse, and their Mace carried before them, at the Proclaiming of the King's Majesty. Ordered, That the Lord President of the Council of State do attend the Proclaiming of the King's Majesty; and that his Mace be carried before him; and that he go next to the Speaker of the House of Commons. Gentlemen, The House hath considered of your Message; and their Answer is, that they are ready likewise. Resolved, That the Members of this House do go, Three and Three in a Rank, in performing the Solemnity of proclaiming the King. 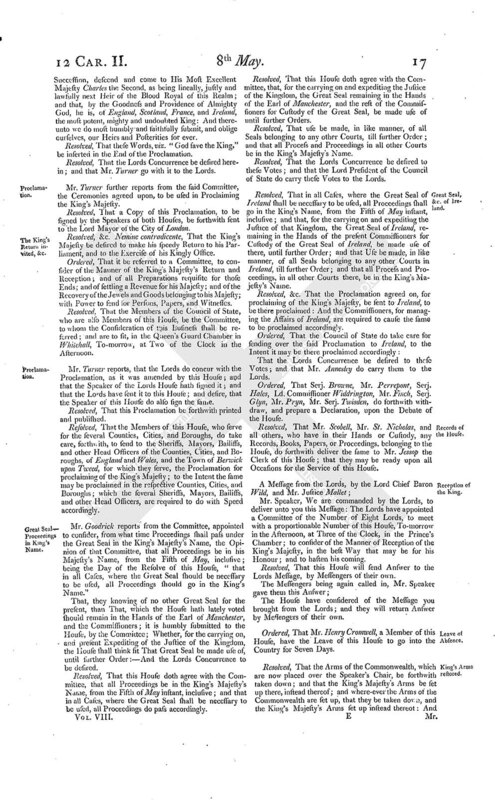 The usual Subscription, upon agreeing to the Amendments, sent from the Lords, to the Bill, intituled, An Act for removing and preventing all Questions and Disputes concerning the Assembling and Sitting of this present Parliament, being written by the Clerk; the same was read. Ordered, That Mr. Pryn do carry this Bill to the Lords, for their Assent. Ordered, That Mr. John Rolls, a Member of this House, have the Leave of this House to go into Holland, upon his own Occasions. Ordered, That the Lieutenant of the Tower, and Mr. Baldwin, two Members of this House, have the Leave of this House to be absent from the Solemnity of proclaiming the King: And that they repair to the Tower, and there take Order, that the highest Expression of Joy, that can be made, be made, by shooting off the great Guns there. Ordered, That Mr. Pryn and Mr. Turner do go to the Lords, and acquaint them that the House is ready to attend the Solemnity of proclaiming the King.